This year, our students decided to create three conceptual gardens. All of the gardens were installed on the west side of Garfield High School, extending from the existing Peace Garden northward. The Evolution Garden site consisted of a two-level grassy terrace bordered by the school building and an ivy covered slope. Several social paths existed, leading students between the terraces, the school, and the sidewalk and bus stop on the site’s western edge. Only a few plants existed on the site, most of which were invasive, overgrown, or both. The majority of the site is very sunny, although the southern end receives partial shade, creating a variety of microhabitats. The students decided to create a teaching garden showing plant diversity and evolution, from primitive ferns to gymnosperms to more advanced flowering plants. The plants were selected to demonstrate a variety of taxonomic and evolutionary characteristics and were arranged to show evolutionary progression. We prepared the site by removing the English ivy (Hedera helix), grading the slope, and spreading a thick layer of mulch. Existing plants were pruned and salvaged when possible, though some had to be removed due to disease or poor health. The social paths were incorporated into the design by installing stairs through the terraces, and temporary bamboo fencing was installed to protect the establishing plants. This site is located on the west side of the greenhouse, bounded by a loading dock to the south and a dividing wall to the north. The area had a slope of approximately 50% and had been overrun with invasive species, primarily English ivy and Himalayan blackberry (Rubus discolor). The site is bordered by a Camellia and a Pieris japonica and contains a stairway leading to the greenhouse. After analyzing the site, the students decided to create an intimate garden that could be used to teach students about herbs and ethnobotany. The students decided to install terraces to allow easy access to the garden as well as add another function (access) for the existing stairways. After removing the invasive species, the students spread mulch over the site to prevent soil erosion. Since the soil has a moderately high lead concentration, the mulch also helped to prevent the emission of lead-laden dust from the bare soil. The existing trees were arborized to improve visibility, safety, and light penetration to the site. After the terraces were created, a variety of herbs were planted and arranged according to their light requirements and mature sizes. Finally, small signs were created to help visitors identify the plants and to create a more personalized garden. 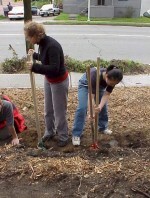 The third site was directly south of the Peace Garden installed by Garfield students several years ago. The new garden was installed between the sidewalk and the building in an area bordered by a loading dock and the Peace Garden. This area, which receives heavy sunlight, had a very steep, sandy slope covered with English ivy and other invasive species. Since the Garfield community wanted a garden that required minimal maintenance, the students decided to create a teaching garden planted with Northwest natives that were drought tolerant and could resist insects and disease. Since safety was a concern, the site was planted primarily with groundcovers and low-growing shrubs, leaving a clear line of visibility; existing plants were also arborized for safety purposes. The students decided to extend the retaining wall that exists in the Peace Garden, creating better continuity while also providing seating for visitors. 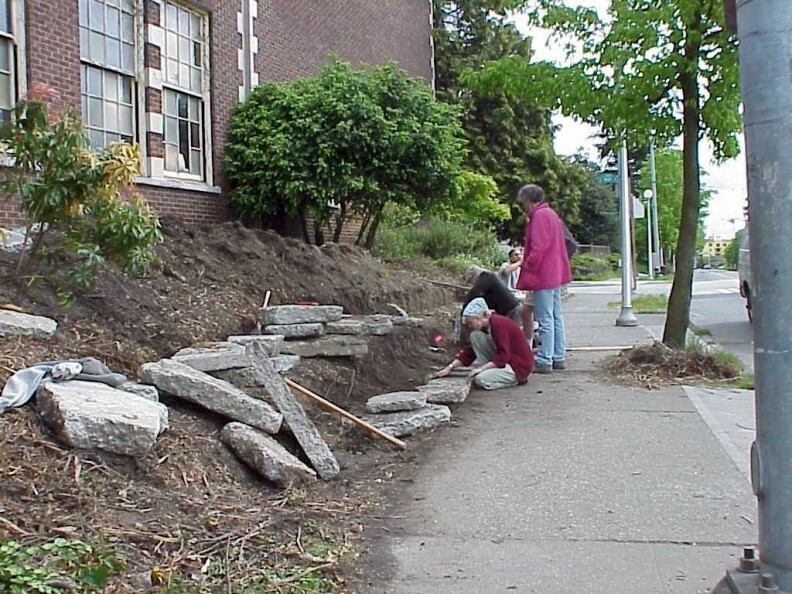 After the retaining wall was built, native plants were installed and mulched. The combination of the plants and wall should not only create a more pleasant and educational garden, but also reduce erosion. 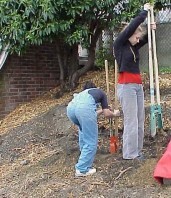 Below are descriptions of the three gardens and pictures of our weekly work parties. Click on any picture to see the image enlarged. Thank you to the following donors of time and supplies! John Sullivan and Bill Alexander, Dirtt, Inc.